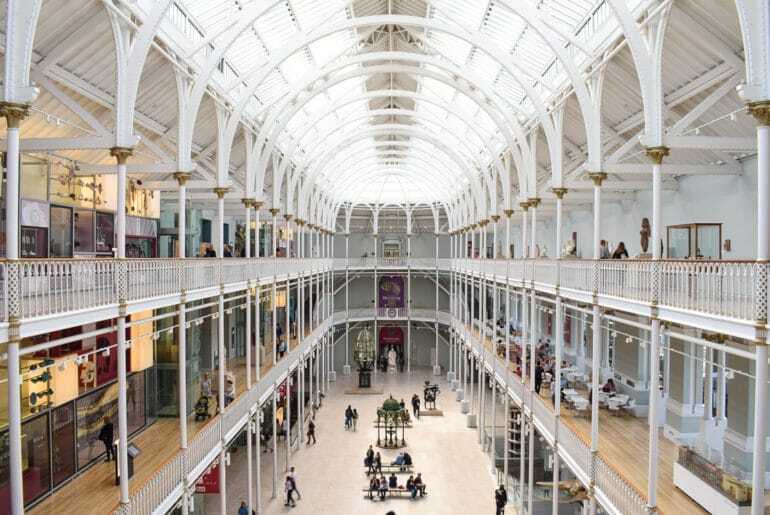 Some of the Best Things to Do in Edinburgh – Free and Paid! Edinburgh is a fantastic city for tourists. The city has so much to offer sightseers, adventurers, photographers, and tour groups – basically everyone! 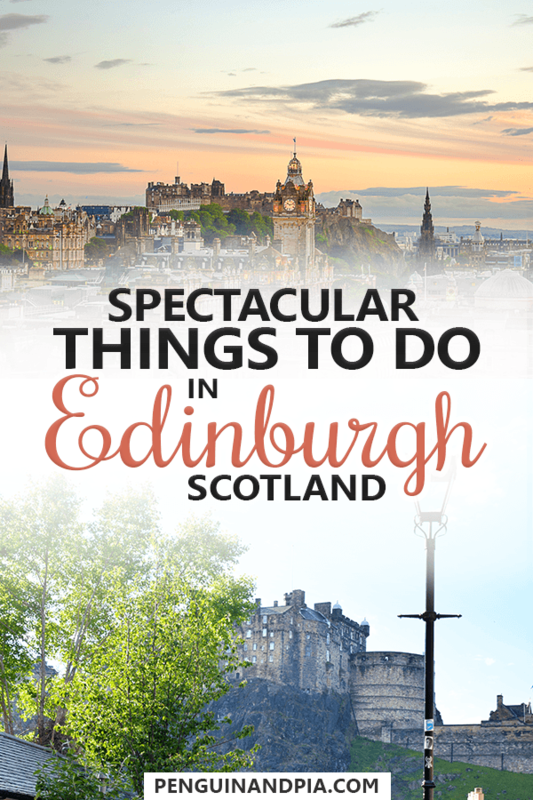 The Edinburgh city centre alone has countless attractions and there are tons of things to do in Edinburgh – and that’s just counting the obvious things. Down each side alley, or “close”, you’re bound to find a wee little pub, a shop, or a museum dedicated to something “classically Edinburgh”. Since all of these options can be so overwhelming if you’ve never visited before, we’ve compiled a SMALL sample of a few of our favourite attractions in Edinburgh. We’ve also included a few notable things that every visitor raves about when they visit Edinburgh! From the least expensive to the most expensive, here’s a list to get you going with sights to see on your trip to Edinburgh. Edinburgh is a great city for budget travellers (even though the accommodation can be expensive) since there are lots of free things to do in the Scottish capital. Some of our favourites are the following. If you walk down the Royal Mile to the Parliament and look right, there’s a giant green hill that you literally will not miss. Go climb it! There are dozens of different routes up to the top – and you can expect a hike to take you 45 minutes to an hour to get to the top. You can also walk all the way around it – it’s a nice path as well. Be sure to bring a jacket as it can get quite windy/chilly up there! If you head for the Balmoral Hotel (large clock tower in New Town) head Northeast and you’ll find your way up Calton Hill. There’s plenty to see up there – from Nelson Monument (see below) to just soaking up in the breathtaking views of Edinburgh! This old cemetery is quite the spooky place to visit any time of the year. Famous for its tales of grave robbers, you can find the inspiration to characters in Harry Potter from the names on the tombstones. It’s located in Old Town, between the University of Edinburgh campus and the Royal Mile. Located right on the Royal Mile, this beautiful cathedral is free to enter and check out. Having lived in Edinburgh, it’s something you walk past all the time without thinking twice. It wasn’t until we “played tourist” with a friend visiting from out of town that we discovered the beautiful interior! The iconic castle in the heart of Edinburgh is always a highlight. Looking for it? Just walk up the Royal Mile. Personally, the photographs of the castle from the front entrance are worth the hike. You can pay to enter, which we will get to down below in this post! Want to see a dinosaur, a shark, and a bunch of artifacts all under one roof? Then come on down to the National Museum of Scotland! The amount of exhibits is astounding – and it’s all free! It’s nice to leave a donation if you can, though. Little known fact: There’s a rooftop garden/terrace on top of the museum that offers great views from within Old Town. Just head up the stairs or elevator. If you fancy a tour of how democracy works in Scotland, book yourself a tour of the Parliament. In a building known to turns heads with its modern architecture. The tours are informative and allow visitors a great glimpse into understanding politics and culture in Scotland, and the United Kingdom, in general. Located on the Mound (the area near New Town and Princes Street Gardens) the National Gallery houses some incredible pieces from some incredible artists. With exhibits changing all the time, it’s best to have a look at what’s on for the month before you visit! Admission is free, but again, donations are what keep these amazing attractions alive! You can read more about various National Galleries of Scotland here. This huge green space in the city’s northwest is a wonderful getaway for a few hours. The garden grounds are free, and the Glasshouses will cost a little bit of money (see below). Learn more about the Royal Botanical Gardens here. In addition to lots of free attractions, there are also many cheap things to do in Edinburgh. In the following, you can read about three of those attractions. This is a personal favourite of ours. 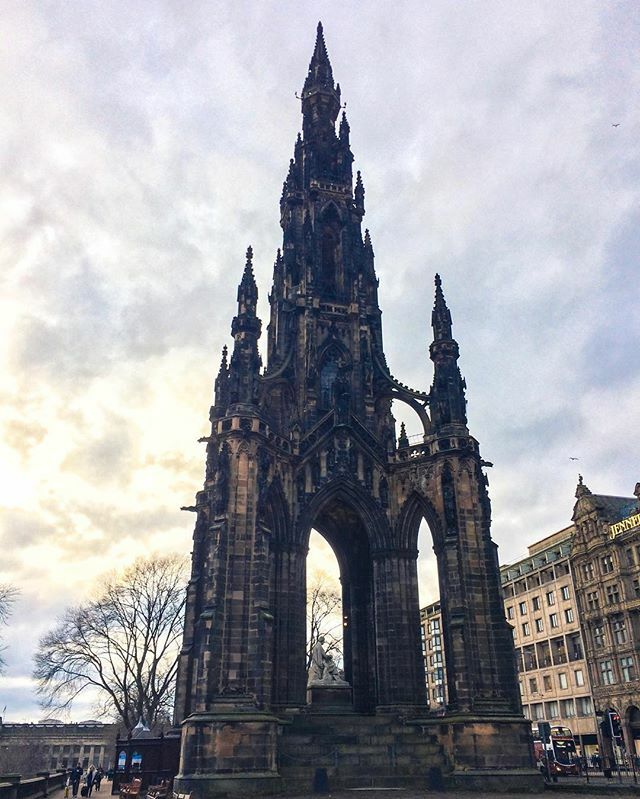 We’ve definitely talked about Scott Monument before – and since it’s the tallest monument in the world that is dedicated to a writer – Sir Walter Scott – we think it deserves another mention. The views you can get from within the city limits are just great and totally worth the climb of the 287 steps. It’s the best little side trip and exercise component of any Edinburgh visit – in our opinion! The cost to go up is £8.00 (as of summer 2018). You can read more information about Scott Monument here. 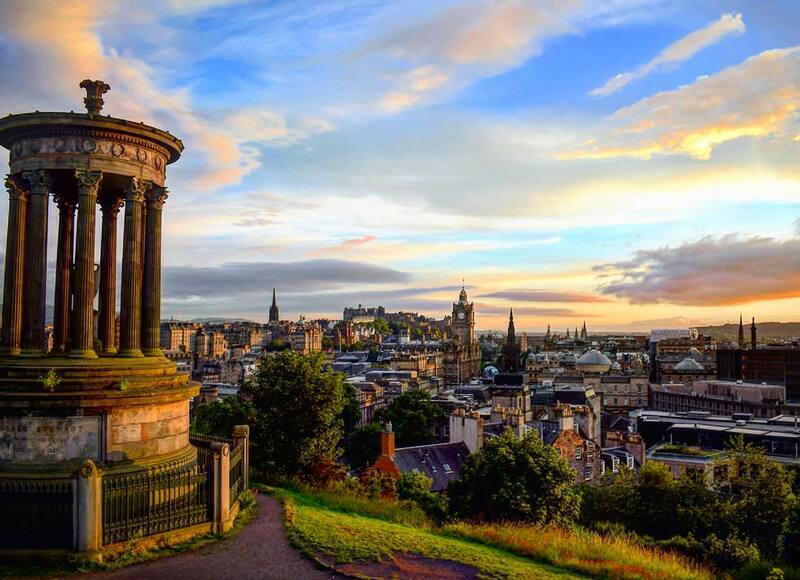 Everyone knows about Calton Hill, but there’s much more to do up there after you snap a few photos and take in the beauty of Edinburgh below. Nelson Monument is the thing that looks like a giant telescope. Believe it or not, it can be entered – and if you’re feeling like climbing the 143 stairs to the top observation deck, you’ll get an EVEN GREATER view of the city. There is a small fee. It’s £5.00 to enter for adults and children. Your price of admission gets you great views of the city, AND access to a pretty full exhibit dedicated to Nelson himself. You can learn all about naval history (which we found to be really interesting – no joke), the significance of the monument, and the ball timepiece on the top that still drops at 1 pm every day. It had great significance to 19th-century seafarers. You can read more about Nelson Monument in Edinburgh here. The Royal Botanical Gardens are free to enter and walk about – but the Glasshouses, where a number of exhibits and flora are featured, require a small fee for entry. To enter and access the exhibits, it’s £6.50 for Adults*, £5.50 for Concessions*, and children 15 and under are free. The asterisks mean that those prices include a “voluntary donation to the Gardens” which is just a nice thing to do, now isn’t it? You can read more about the Royal Botanical Gardens admissions here. As in every big city that is popular among tourists, there are lots of attractions and activities that you have to pay for. Some of the most popular ones are listed below. Ah yes, visiting Edinburgh Castle. Lisa has paid a full proper visit. Eric has walked in as far as you can go without paying – which is actually a fair bit. Generally, and don’t let this fully discourage you, the word on the street is that it simply wasn’t worth the money for the interior – the hike up there and the photographs of the castle and the surrounding area are good enough. However, for the history buffs and the curious – here are the prices: Adult (16 – 59 yrs) £17.00, Child (5 – 15 yrs) £10.20, Concession (60 yrs+ and unemployed) £13.60. The website for the Edinburgh Castle information is here. Red Bus – City Sightseeing Tour: This is the classic “Hop-on Hop-Off” you see in cities around the world. This route allows you to see the most popular attractions while emphasizing that you can get off and go visit (entrance tickets to attractions not included in bus ticket price). This is an audio tour available in multiple languages. Green Bus – Edinburgh Tour: This tour is more focused on the rich history that Edinburgh has to offer. There’s a lot of the same points of interest covered on the red bus BUT this is a live guided tour. So, you learn about Edinburgh from a real guide who tells stories and generally will have more personality than an audio track. Blue and Yellow Bus – Majestic Tour: This tour doesn’t focus on the Old Town, New Town, and Castle much like the other two. Instead, you’ll be taken closer to the water in Leith, and further from the centre to other attractions and sights in Edinburgh like the Royal Botanical Gardens. This bus has an audio tour so no live person, should that make a difference for you! Penguin’s Edinburgh Bus Travel Tip: Buy a Ticket for 24 or 48 Hours that Covers all the Bus Tours! Also commonly known as “Holyrood Palace” this magnificent attraction is the residence of Queen Elizabeth II when she visits Scotland. Located at the bottom of the Royal Mile, you can’t miss it! Inside, you’ll find exhibit after exhibit showing you the history of the Palace – dating back to the 16th century! Also, the tours are self-guided audio so you can move at your own pace! Ticket prices for 2018 are as follows: Adult £14.00, Over 60/Student (with valid ID) £12.70, under 17/Persons with Disabilities £8.10, Under 5: Free, Family (2 adults, 3 under 17s) £36.10. To learn more about Holyrood Palace, visit the website. If you want to, you can also buy your entrance ticket beforehand. Located near Waverley Station, the Edinburgh Dungeon is a must-see for the travellers who like to be creeped out, spooked out, or generally like to address the darker side of a city’s past! The prices range from £13.00 for a basic entry ticket all the way up to £28.00 – and this is if you purchase online. It’s cheaper to purchase in advance online. If you “walk up”, the tickets are a few pounds more expensive. But the Dungeon has solidified itself as one of the top attractions on Edinburgh, so if you’re keen to spend the money it should be on the list! You can check out the tours and tickets for the Edinburgh Dungeon here. The Ghost Bus is something you see parked on the Royal Mile just down from the Castle and think “what IS that? !” If you’re looking to learn more about the spooky side of Edinburgh – from ghosts to legendary murderers – then this is the bus for you! You ride an antique decorated black bus around Edinburgh at night with a theatrical guide who tells jokes and stories as you explore Edinburgh’s creepy past. Definitely something different from all the day walking and scotch tasting! Here’s the official website if you’d like to learn more! Penguin and Pia’s Spooky Travel Tip: Buy Your Ticket For The Ghost Bus To Be Hauntingly Entertained! If you’re heading towards Leith, you’ll end up at the Ocean Terminal – and you’ll set your eyes on the Royal Yacht Britannia! Just take the Buses No. 11, 22 or 35 from the city centre. We’ll let you check it out to learn all about the dates and the history – which is plentiful! Prices are £15.50 per adult, £13.75 for seniors, and £8.50 for children. These tickets are valid for a year so you can come and visit as many times as you wish for that price. Check out the website for the Royal Yacht Britannia in Edinburgh. You can purchase your ticket for the highly-rated 2-hour yacht tour here! This wacky world of illusions is definitely a fun one – and not something you’d expect to be visiting when you think of “attractions in Edinburgh”. Nonetheless, it’s a great way to entertain the kids – and the adults, too! The interactive exhibits allow you to fully engage, and the introductory session is a great way to learn a little bit about the science of light and images! Basically, go if you want to feel like a kid again. The prices are: Adults: £15.00, Students (with ID): £13.00, Seniors: £13.00, Children (5 – 15 years): £11.00. You can check out the website for Camera Obscura for more information. 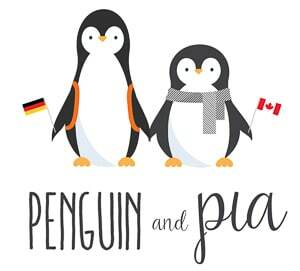 If you’re looking for more kid-friendly activities in Edinburgh, be sure to read Marianne’s post here. The Scotch Whisky Experience cannot be beaten. Period. You learn all about Scotch the proper way! You’ll ride in a giant barrel on a historic ride to learn about how scotch is made. Then you enter a learning room where a live person will walk you through the regions of Scotland and the whisky produced in each one! Everyone gets a taste of scotch with the Standard “Silver” tour ticket in this room. If you think that’s cool – you’ll then be brought into the world’s largest collection of scotch. It’s quite the sight! If you buy the “Gold Tour”, you’ll then get access to the tasting bar, where they will walk you through a sample of scotches from all four regions you just learned about. The cost of the Gold Ticket is £27.00 – but well worth the extra money from £15.50 for the “Silver Tour”. The knowledgeable bartenders will pour you others to try (for an additional fee but also worth it to learn from professionals). It’s a scotch tasting, done right. You can read here about the Scotch Whisky Experience in Edinburgh. There you have it! A list of definitely not all the things you can do in Edinburgh! Okay, what did we miss? Let us know in the comments below! There’s bound to be a few hidden gems and obvious favourites that we didn’t mention!